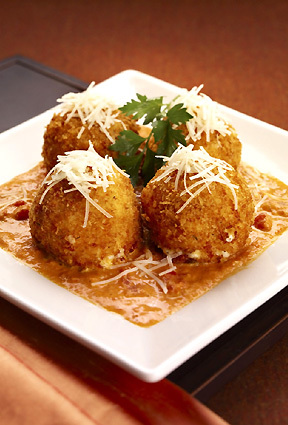 Ever since I saw Cheesecake Factory’s fried mac and cheese balls on ‘Unwrapped’ I have been obsessed. They’re almost a staple now when I visit Cheesecake Factory. I went camping this weekend and thought they would make great outdoors side dish. I was right. 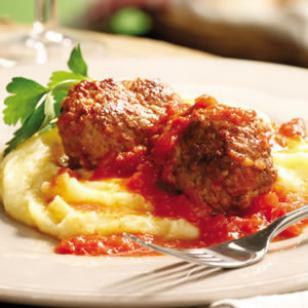 These balls are some work, and next time I will moderate the recipe, but they got great reviews! I searched the web and found the recipe below over and over claiming to be the secret recipe. Below are my notes/tips in pink. Vegetable oil, for frying I didn’t have enough vegetable oil so I used olive oil. It produced a more golden brown coloring than regular vegetable oil. Cook the macaroni according to package instructions. Drain and rinse with cold water to stop the cooking. Drain again and set aside. In a saucepan, melt the butter over medium heat. Sprinkle the flour into the butter and stir it with a whisk. Cook for 2 minutes. Whisk the warmed milk into the flour mixture, working out any lumps. Cook until the sauce thickens, about 2 minutes.Remove from the heat, add the cheeses, and stir until melted and smooth; season with salt and pepper. I found I needed to put this over heat again in order to get the cheese to melt. Fold the cheese sauce into macaroni. Pour the mac and cheese into a shallow pan and refrigerate until cold, at least 2 hours. I didn’t have a large enough pan so I used the big pot I boiled the maccaroni in (which had cooled by now). This wasn’t too shallow and in retrospect I should have left them in the fridge for another hour or so. One comment on a review said she used Velveeta cheese. Next time I think I will try Velveeta. Personally, I think 1 lb of smoked Gouda was too over overpowering of a flavor. What I liked is that these balls were cheesy, but not too gooey, so they didn’t feel too heavy. If you want more cheesy I would def substitute Velveeta and, if you want more of an American mac and cheese flavor substitute American for Gouda. Also, one commenter said she called Cheesecake Factory and they told her they used White Cheddar, Fontina, and Jack cheeses. Next time I think I will use White Cheddar and Fontina instead of Gouda. Shape the cold mac and cheese into meatball-sized balls and place them onto a waxed paper-lined tray. It makes this sooo much easier if you have an ice cream scooper!! Freeze the balls overnight. This took up a lot of room in the freezer, so beware. I forgot to buy wax paper at the store, so instead I used a regular cookie sheet and sprayed it with cooking spray. Worked great. TIP: If you’re using wax paper for actual baking, then you might not really need wax paper, you can substitute with aluminum foil or a metal pan. Remove the mac and cheese balls from the freezer. Dip the frozen balls into the egg wash then into the break crumbs. Put the balls back into the freezer until you are ready to fry. Heat the oil in a deep-fat fryer to 350 degrees F. I do not have a deep-fryer. Instead, I heated oil over a gas flame. This resulted in my first batch, two balls, being burnt. I had only left them in for less than a minute. Make sure the flame is on medium heat at the most. Fry the mac and cheese balls until they are golden brown and center is hot, about 4-5 minutes. If you are not using a deep-fryer make sure to experiment on the first two or three. The balls need to cook for a couple of minutes so they are completely warm through-and-through. If you cook them only a fraction of the time the balls will look fried from the outside but may still be partially frozen or pretty cold on the inside. Serve hot with your favorite marinara for dipping. What do you think can you not wait to try these?! After I got back from the camping trip I reheated a few up in a frying pan over low heat. I turned them and directly added marinara sauce. They were till very good!! On my way to the last Harry Potter movie ever I grabbed a meatball sandwich from Subway. They’re pretty good and only five dollars for a footlong. However, the meatballs tasted kinda funny. I kept eating most of the sandwich b/c well I was hungry and paid for it and that’s just the type of person I am. BUT. I thought to myself, I can make this. I can make this better. So I made meatballs. Healthy meatballs. The recipe takes about two hours total, but you make a lot. I froze what I didn’t use this week. I’ve had two meatball sandwiches for lunch this week and I’m pretty sure I can have two meatball sandwiches at work for the next two months. It's worth the effort to make this recipe!! Freeze up to three months. 2 28-ounce cans diced tomatoes I stopped by the clearance racks at my grocery store– which consists of dented cans and found 1 14 oz can of diced tomatoes half off. I also found two 7.5 oz cans half off, one that was fire roasted tomatoes and garlic, the other tomatoes with onions and green peppers. They added just a lil more flavor. I also used less garlic b/c I can had garlic in it. 4 cups diced plum tomatoes, (about 1 1/2 pounds) After reading one review that said it was too saucy and knowing that I wanted these for sandwiches and not pasta I completely cut out this part of the recipe. 2 cups cubed whole-wheat country bread I used regular sized bread crumbs and the consistency turned out great. Place bulgur in a medium bowl and cover generously with hot water. Let soak for 30 minutes. Drain in a fine sieve, pressing to remove excess liquid. Meanwhile, heat 1 tablespoon oil in a large Dutch oven over medium-low heat. (I used a large sauce pan.) Add garlic, oregano and crushed red pepper; cook, stirring, until softened but not browned, about 1 minute. Stir in canned tomatoes and plum tomatoes; increase heat to medium-high and bring to a simmer. Reduce heat to low. Partially cover and let simmer while you prepare meatballs. Place bread in a medium bowl and cover with cold water. Let soak for a few minutes. Drain and squeeze out moisture. Whisk egg and egg white in a large bowl. Add the bulgur, the bread, beef, Parmesan, cinnamon, pepper and salt. Gently combine with a potato masher and/or your hands. Form into 20 oval meatballs about 2 inches long. Heat the remaining 1 tablespoon oil in a large nonstick skillet over medium-high heat. Add half the meatballs and cook, turning occasionally, until browned all over, 3 to 4 minutes. Transfer to a paper towel-lined plate; blot with paper towels. Brown the remaining meatballs. Mash the simmering tomato sauce with a potato masher to break down any large chunks of tomato. Add the meatballs to the sauce. Simmer over low heat, partially covered, for 50 minutes. Taste the sauce and add sugar, if it seems tart, and additional pepper to taste. Serve the meatballs with the sauce. Make Ahead Tip: Cover and refrigerate for up to 3 days or freeze for up to 3 months. Ingredient note: Bulgur is made by parboiling, drying and coarsely grinding or cracking wheat berries. It simply needs a quick soak in hot water for most uses. Look for it in the natural-foods section of large supermarkets, near other grains, or online at kalustyans.com, lebaneseproducts.com. I bought some nice sandwich rolls to complement my meatballs. I keep them separated at work until I’m ready to eat. Then I microwave the meatballs and put the roll into the toaster oven. Viola!! Per serving: 283 calories; 11 g fat ( 4 g sat , 4 g mono ); 73 mg cholesterol; 20 g carbohydrates; 23 g protein; 5 g fiber; 687 mg sodium; 271 mg potassium. Nutrition Bonus: Vitamin C (60% daily value), Vitamin A (30% dv). So I went into Nordstrom’s this Friday afternoon for a free Philosophy Oxygen Facial Mask as a promotion for their Anniversary Sale. I love the Philosophy line — especially their new make-up line. As I sat there, hair pulled back white goop all over my face, the woman giving me the mask starting asking me what products I use, especially to help with problem areas on my skin (stupid adult acne). 1. Washing my face in cold water. Cold water closes the pores. Warm/hot water opens them up. This has been pretty easy b/c the summers in DC are soooo hot. However, if you love your hot showers, try instead splashing cold water on your face from the sink once you step out. 2. Complementing/substituting my night creme with Vitamin E Oil. 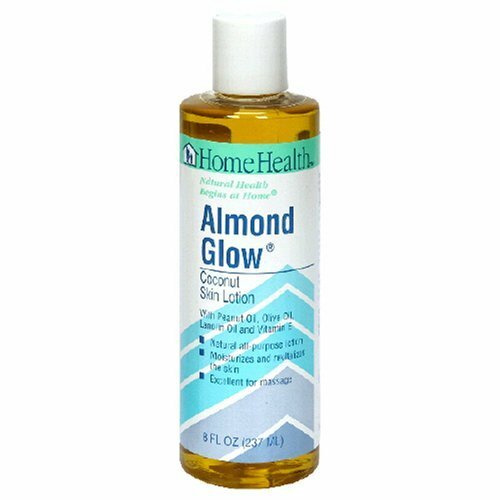 I’ve been using ‘Almond Glow: Coconut Skin Lotion.’ It has peanut, olive and Vitamin E. Topical Vitamin E will help with scarring. Although I naturally have oily skin but using this oil is actually a pretty good alternative to night creme– it’s cheap and in the morning my skin always feels softer. Though I would be hesitant to try it out in the morning as a moisturizer unless you have dry skin. How I use this product: I put a less than a dime amount in my hand, I start first putting the oil under my eyes and in areas where I have a little scarring, then I blend on the rest of my face. If I have any left over I will massage my neck. Makes for a great night moisturizer. 3. For the past six or so months I’ve also been using Sephora’s Precision Pore Cleansing Pad. I thought enough of this product to get it for a friend for her birthday. (Actually I made her this great humidity/beauty basket which included my homemade body scrub.) This product is cheap, lasts a while and also leaves my skin feeling a little smoother. Recently I’ve starting using it twice a day though I could probably go back to just once a day to make it last longer. Pretty in pink precision pore will help your skin feel softer. What it does: This tool uses tiny bristles to invigorate the skin and effectively clean pores, helping to exfoliate and soften the skin. Online reviews: This product has over 600 reviews on sephora.com and averages 4/5 star rating. Other thoughts: Soft enough for sensitive skin. There are three different brush heads for normal, sensitive and delicate skin. 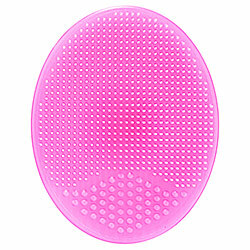 For people who have backne or acne on other places of their body you might want to check out the Clarisonic Classic. How to use: The product is water-proof so you can use it in the shower. It is timed to go off after one minute. Recommend use is: 20 seconds forehead, 10 each cheek, nose/chin 20 seconds. Wet your face and put your liquid facial cleanser on the brush and go! What the Nordstrom Anniversary package includes: Two brushes (and I was able to score an additional brush for free), cleanser, travel bag, and charger. My review:I couldn’t wait to get home and try this out. I have used it only once but I have to say after one use my skin felt slightly smoother/softer (could particularly notice on my checks). I will post further reviews at 2 and 4 weeks. Price: A little pricey. But it’s your skin and my life long goal to go back to being make-up less (or at least looking fabulous w/o it). I have not had a facial in over a year and a half (b/c I’m cheep and am determined to give myself mini-facials at home, and also all about preventative treatment) so I justified this as 1/1.5 facials. At Nordstrom I paid $149 for over a $200 value (which includes the extra extra free brush I received at the counter). I also told myself that if I hate it it’s Nordstrom’s and they will take it back no matter what. Notes/tips: Each brush lasts 4-5 months and has anti-bacterial bristles. After 2-4 weeks you will start to break out because your skin is being purged (like what happens after a facial). It is careful to note that this may go on longer for you and after a month you may feel like using the product less, but keep with it! The woman at Nordstrom’s said she was breaking out after a month but powered through and her skin is so much better. Also, it is recommended to use only once a day for a month, after that you can up the use to twice a day. Extra notes to myself: Since I am (holds breath) a resident on the East Coast (sigh) and see myself here for at least another 2-3 years (baring love’s and the universe’s plan for myself) I need to be like mama and make friends with the women at Nordstrom’s back home b/c they always hook my mom up! Lastly, if you’re thinking of purchasing one I would compare sale/promotion prices at Sephora, Macy’s and Nordstrom. At Nordstrom’s you can usually get an extra free brush (as I did w/o even trying, but try!) or facial cleanser. They also have a light pink one for breast cancer. My gay boyfriend introduced me to this website and although it is lacking in dessert and appetizers it has great recipes. It has a menu and meal planner, cooking tips, 20-minute recipes, recipes for two and so much more! 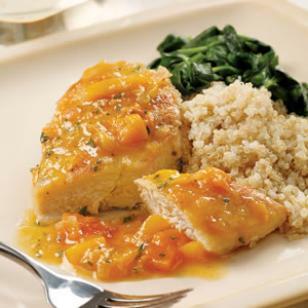 My favorite thus far is seared chicken with apricot sauce. I shared it with my mom and she made if for company and everyone loved it. Enjoy!! Off the heat, add wine and shallot to the pan. Return to medium heat and cook, scraping up any browned bits, until slightly reduced, about 3 minutes. Add apricots and cook until the fruit begins to break down, 2 to 3 minutes. Stir in preserves, tarragon and the remaining 1/2 teaspoon salt. Return the chicken to the pan and cook until heated through, 1 to 2 minutes. Serve the chicken with the sauce. Per serving: 252 calories; 5 g fat ( 1 g sat , 3 g mono ); 66 mg cholesterol; 15 g carbohydrates; 4 g added sugars; 27 g protein; 1 g fiber; 517 mg sodium; 444 mg potassium. Nutrition Bonus: Vitamin A (15% daily value). 1. You are going to have to cook the sauce longer than the recipe says. Probably at least twice as long. 2. For leftovers I heated up the chicken and sauce, let it cool and put it over arugula!! Mmmm!!!! So good. The sauce alone could be used as a nice dressing. Sooo tasty! 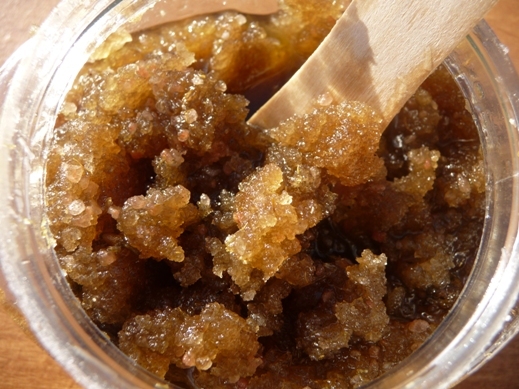 Homemade brown sugar scrub. So easy to make and great for the skin! Since I love making things from scratch and I highly dislike big prices I decided to finally make my own body scrub. I used the house brand of Sugar in the Raw, Turbinado brown sugar because I liked the texture better, it wasn’t as fine as other brown sugar and offered a more crystalized rub, like salt scrubs. Since it’s winter and my skin can get dry I wanted something that would help add moisture. I also wanted a sugar scrub instead of a salt scrub because it is more like a polish but I got the best of both worlds using the Turbinado sugar. For the coffee grinds I substituted some instant coffee (some vanilla latte or something) I had left over from when my mother visited last fall. I don’t make coffee at home so it was an added saved expense to use what was in my cupboard. I added the coffee because the caffeine is supposed to be good for cells and awakening them and even fighting/preventing cellulite. I used regular cooking vanilla for a scent instead of essential oil b/c all of the essential oil I wanted were pretty expensive (um like forty bucks for tiiiiiny thing). And thinking about it I’m looking for function not another girly smell for my man-filled bathroom (did I mention I live with four guys?). Looking back next time I will probably not add the vanilla or add more since the scent didn’t really come through, but again, I’m looking for function not girly smell. Also, I used a coconut scented almond oil so adding the vanilla didn’t really seem necessary. I will probably also add more coffee next time, which I would recommend if you want more of a coffee aroma. Lastly, after using it in the shower before shaving I also used the exfoliant on my lips! Best tasting exfoliant ever! The dry wind and horrible east coast winter weather really does a number on your lips and skin. This totally helped! My legs felt smoother, lips smoother (and sexier) and overall I am happy with my homemade sugar scrub! Use it in the shower before your next date or for yourself to help make your legs feel sexier!